LucidControl product series supplies you with a wide range of USB IO Modules being compatible with various analog and digital signals. In the automation business, common analog signals are for example voltages or currents, which are measured by sensors or which are created in order to interface with other automation components. The analog signal part is covered by the LucidControl AI4 – USB Analog Input Module and the LucidControl AO4 – USB Analog Output Module. The USB Analog Output Module is able to generate 4 independent voltage sources in the range 0-5V and 0-10V. There are also options available which create negative voltages of -5 to +5V and -10 to +10V. Additionally, a current option is available as well. A programmable current source is able to generate 4 independent currents of 0 to 22mA using typical burdon resistors of 250 and 500 Ohms. A typical application for the USB Analog Output Modules is e.g. controlling a 0-10V interface. 0-10V interfaces are standardized and they are often used in order to interface equipment used in automation industry and e.g. the building facility sector or home automation applications. A heating system for example can be controlled by a 0-10V interface where the voltage if referring to a specific temperature which the USB Analog Output Module requests form an heater. 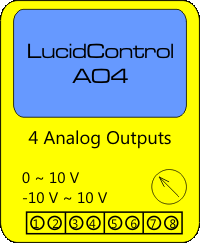 Lamp controllers provide also often 0-10V inputs. Using such a light controller the USB Analog Output Module can be used in order to control and dim up to 4 lights. 4-20mA interfaces are used when a loss-less transmission over extended distances should be established. Using a voltage source can cause losses on long cables because a (often negligible) voltage drop on the transmission line. Current sources cure this by applying a current to the line. Independent on the voltage drop across the cable, the current remains the same and can be measured without error. All USB Analog Output Modules are using a DAC with 12 bit resolution which means that e.g. the 0-10V output can be controlled with a resolution of approx. 2.5mV. The highly precise modules have a typical accuracy of 0.5% which is sufficient for most automation applications. It must be pointed out that all LucidControl USB IO Modules are bus powered and do not need additional power adapters. This is also true for the 0-10V output module even if the USB voltage supply is only 5V (or even a bit lower). Internal voltage regulators generate the necessary power supply. The analog outputs are able to drive real 0V potential so that voltages from 10.0V down to 0.0V are feasible without a remaining offset. LucidControl USB IO Modules are designed in order to work with the embedded computers as the Raspberry Pi and the TI Beagle Bone Black. These mini-sized computers run Linux and are a great help in solving automation tasks. All LucidControl USB IO Modules can be attached on standard DIN-Rails which are present in all distribution boxes or switch cabinets. Using the LucidControl USB IO Modules is a good start to make a tidy design without worrying how to fix the devices. There are no screws or other components necessary in order to install the equipment.